Simple to set up master clock and bell timer. 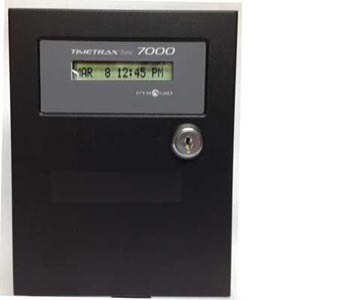 You can control a dozen standard and digital clocks - and it can also ring bells. You can run up to 15 clocks and 8 bells from this one unit. We can upgrade it to run 110 volt bells and buzzers. Set it up using just three buttons at the clock itself. It can signal on any day of the week and exclude others - Sunday for example. Variable duration signals, selectable by event: 1 second for 2 minute warning that lunch will end, 3 seconds for time to go back to work, up to 59 seconds - user-selectable. You set this up using three buttons.